Ocean Boulevard Bistro & Martini Bar is located on the beach road at mile post 2.5 in Kitty Hawk, Outer Banks, NC. Our upscale, yet casual American Bistro and martini bar serves globally inspired fresh regional cuisine. Our menu changes seasonally and offers local Wanchese Seafood, Currituck Produce, and international items sourced from quality purveyors. Ocean Boulevard Kitty Hawk restaurant has a comprehensive wine list with many unique and reserve wines. Our martini bar offers a comfortable, lively setting for gathering and/or dining. Our upstairs area has very nice views of the ocean and offers semi-private dining for variable size parties/events, and we have a fantastic beach side patio for drinks and waiting. We also offer catering for many types of special events, on site and throughout the Outer Banks. 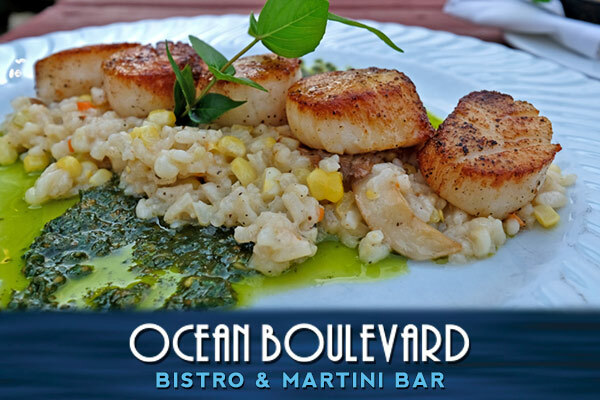 Ocean Boulevard Bistro & Martini Bar is open at 5 p.m. all year long, seven days a week. Join us for our live music on our patio, in season.